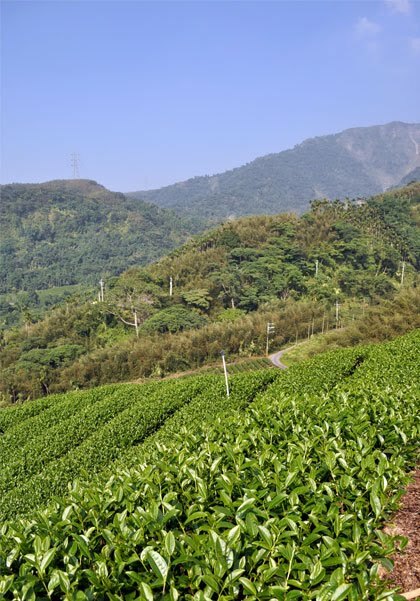 Baozhong tea started near Taipei, in Nangang, but progressively moved south east of Taipei, towards Pinglin, in search of a natural environment, away from the growing capital. 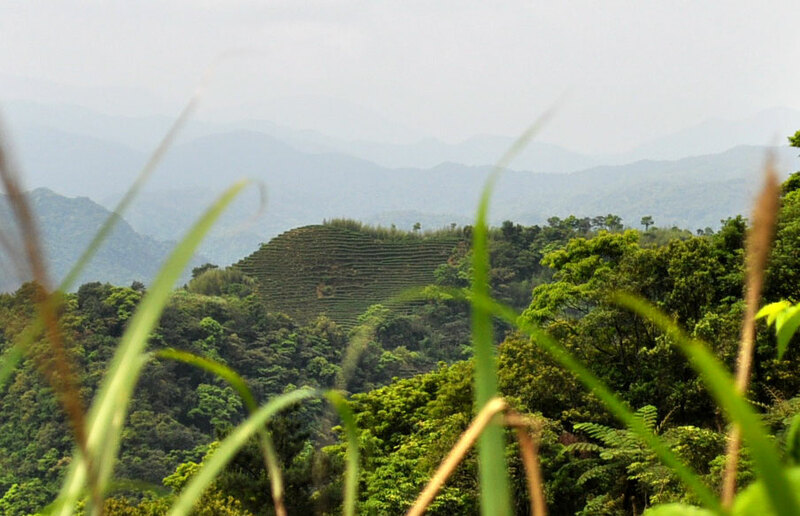 Here, in the Wenshan area, the farmers have found a very well preserved region with beautiful landscapes. 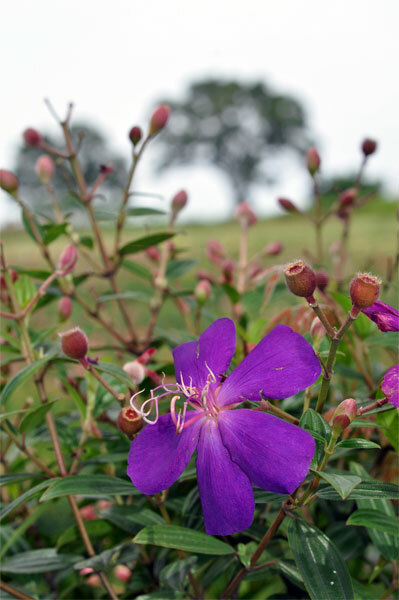 In the 19th century, Baozhong (Pouchong) and flower scented Baozhong were mostly exported to South East Asia by Taiwanese dealers. 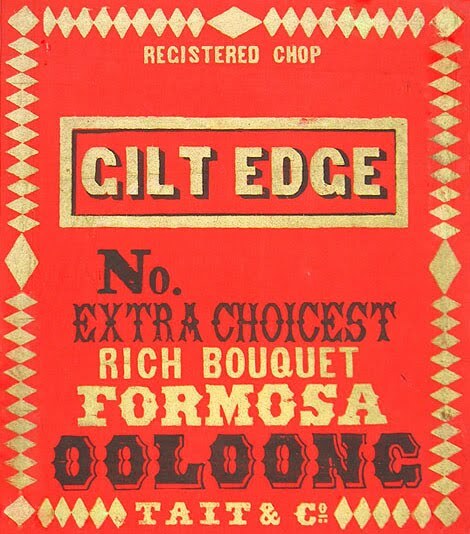 Western dealers like TAIT (see Kirsten Kristensen's picture of an old TAIT & Cie tea label) would use the name 'Formosa Oolong', even though they were exporting the same tea! The name 'Oolong' stands for all semi-oxidized teas. 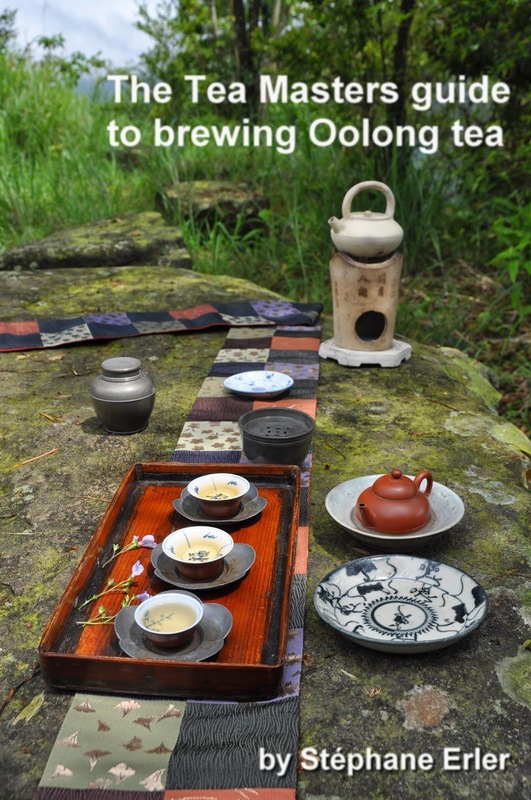 But in Taiwan, nowadays, the name 'Oolong' is mostly used to designate the rolled Oolongs while Baozhong is used for the twisted, unroasted, low oxidized leaves. 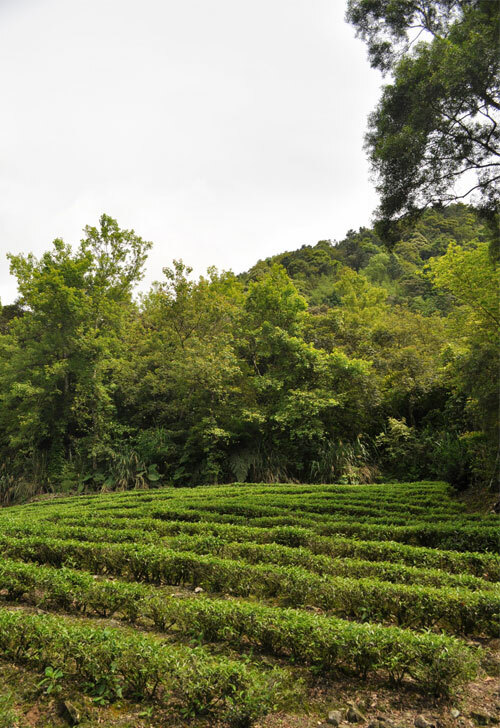 Baozhong can be made with all kinds of cultivars, but the most traditional remains qingxin (luanze) Oolong. The traditional technique, the weather and the environment all contribute to make Wenshan Baozhong distinctive from rolled Oolongs made elsewhere in Taiwan. Hand harvested on April 17. 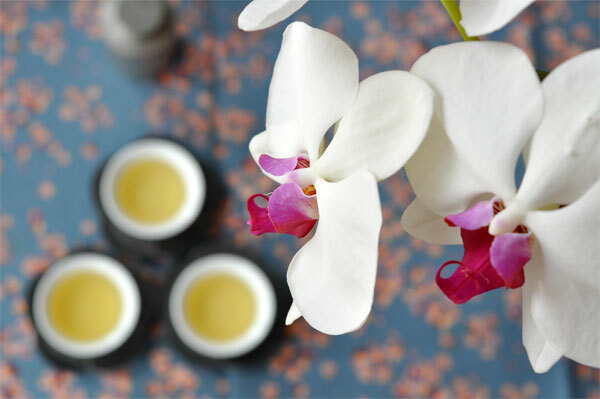 Flowery fragrance mixed with some sea scents reminiscent of Japenese sencha. Very soft and sweet taste, and lingering aftertaste. 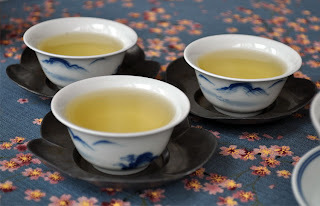 I could also mention freshness, but I would have to do so for all 4 Baozhongs! Hand harvested on April 7. Low to medium oxidation, without stems and very lightly roasted. This is the more traditional version of Wenshan Baozhong. 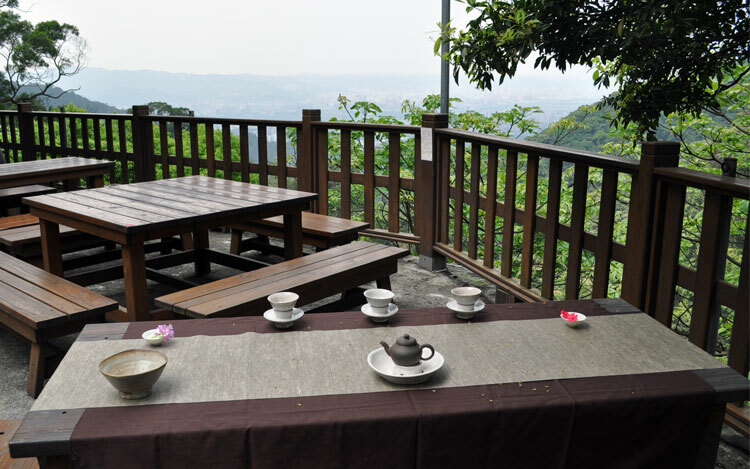 It lets you best smell and taste the aromas of the mountainous forest where these leaves come from. This tea is fine and mellow with a slight astringency that transforms into sweetness as it lingers on and on. 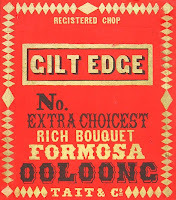 The fragrances are a little bit more fruity and 'foresty'. Low oxidation. Stems are kept on purpose. Intoxicating dry fragrance (hints of lavender). Modern way of processing Baozhong. Very light and 'green' spring fragrances. The taste is clean, soft with a touch of 'lemon'. These leaves have been harvested young (lots of buds) and have a light green color once brewed. 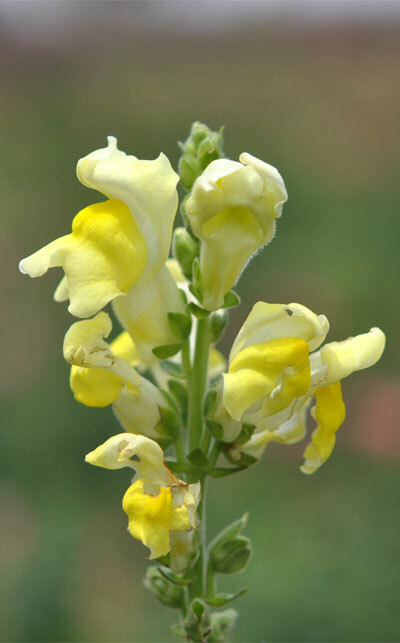 The fragrance is light fruity (mango). The taste is pure and delicate. I took this last picture outdoors to show the very good transparency and clarity of the Baozhongs I selected. 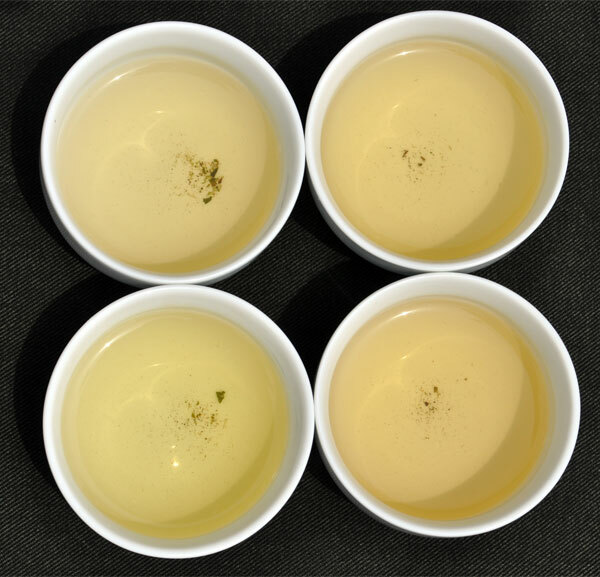 The color (green or yellow) also shows the different levels of oxidation of these teas. 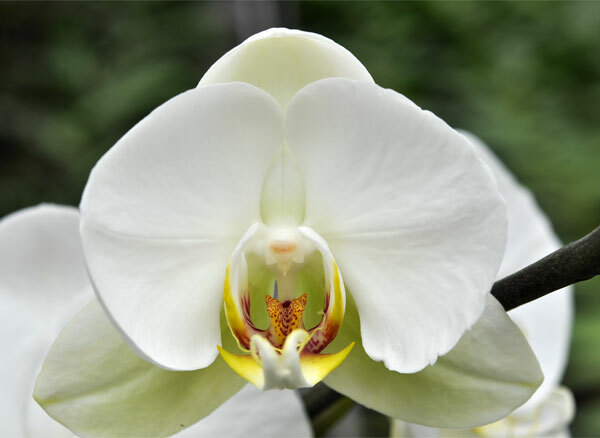 Signe de bonne augure, toutes mes orchidées sont ouvertes! 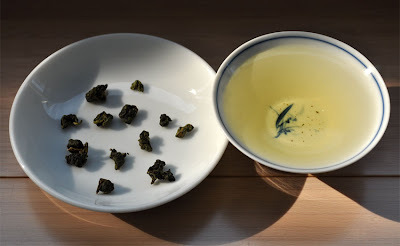 Que cela soit l'occasion de déguster un Oolong de haute montagne fleuri et printanier. Process: roulage en boule, oxyadation légère, sans torréfaction. Récolté à la main le 27 mars 2010. 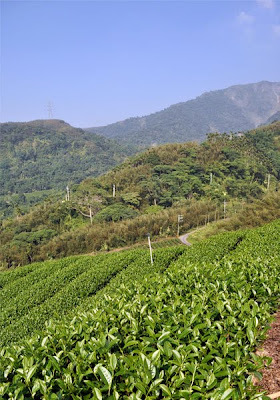 Plantation de Ruei Li, Ali Shan (Taiwan), située à 1400 mètres d'altitude. Dégustation test de 3 grammes infusés avec de l'eau bouillante pendant 6 minutes. Le roulage serré et compact n'en finit pas de me surprendre. Comment de si petites boules peuvent-elles s'ouvrir si grand! En second lieu, je remarque que les feuilles ont été grignotées par des insectes en de nombreux endroits. L'infusion de couleur jaune a une très bonne transparence et clarté. A sec, les feuilles ont une odeur fleurie de lavande fraiche. En bouche, les fragrances jouent sur les registres de fleurs et de fruits frais. On est dans le registre du parfum! Moelleux à souhait. L'infusion est souple et douce. En même temps, elle est très concentrée et remplie de substance. Aussi, elle active mes glandes salivaires et cette petite pointe d'amertume n'en finit pas de se transformer en salive fraiche et sucrée dans ma bouche. On a un parfait équilibre de l'oxydation: légère et fleurie, mais aussi fruité et ample. L'arrière goût de printemps semble infini. Je retrouve aussi une note sèche et rocailleuse semblable aux Yanchas de WuYi. Le tout est soyeux et d'une finesse éblouissante! 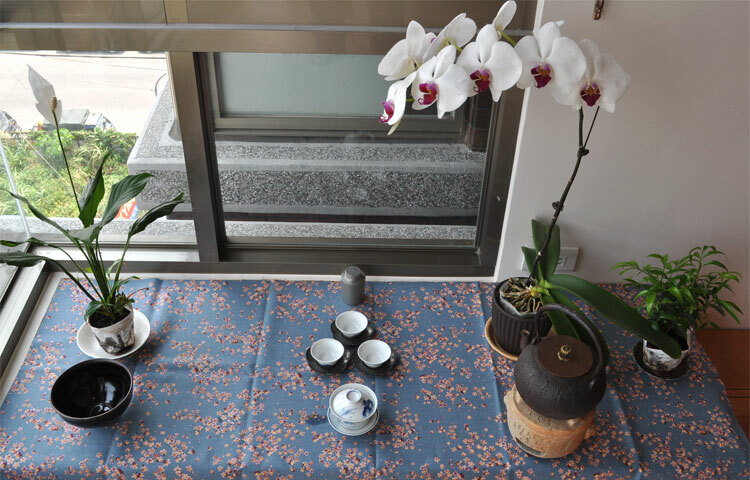 J'ai suivi les conseils de Teaparker et ai utilisé une petite jarre japonaise en étain pour conserver ce thé quelques jours. En effet, il est encore 'trop frais' et a besoin d'un peu de contact avec l'air (mais pas trop) pour s'affiner. J'ai remarqué que les premières infusions nécessite de l'eau particulièrement chaude, juste bouillie, pour bien ouvrir les feuilles. 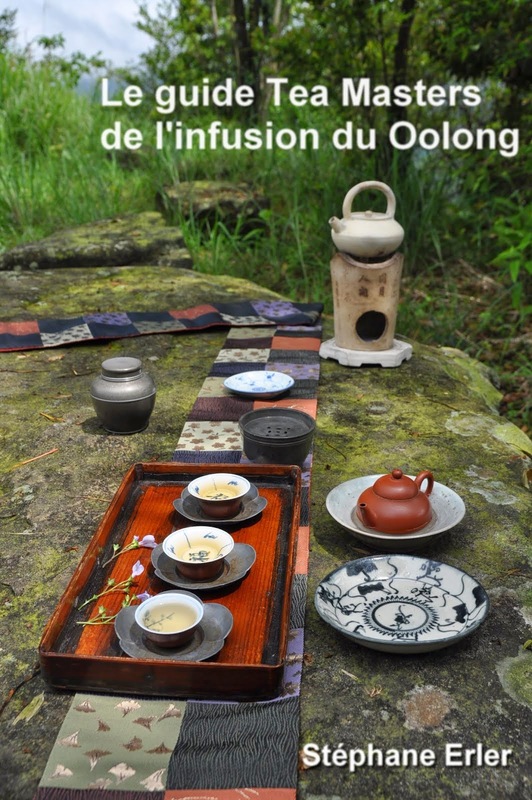 Pour encore plus de finesse et d'intensité, l'optimal sera d'utiliser une théière en zhuni avec cet Oolong de haute montagne exceptionnel. Having sold out my 2006 Qizhong Oolong, I am looking for a replacement for this medium roasted Wenshan Baozhong. Here, I received a promising sample from the same source. 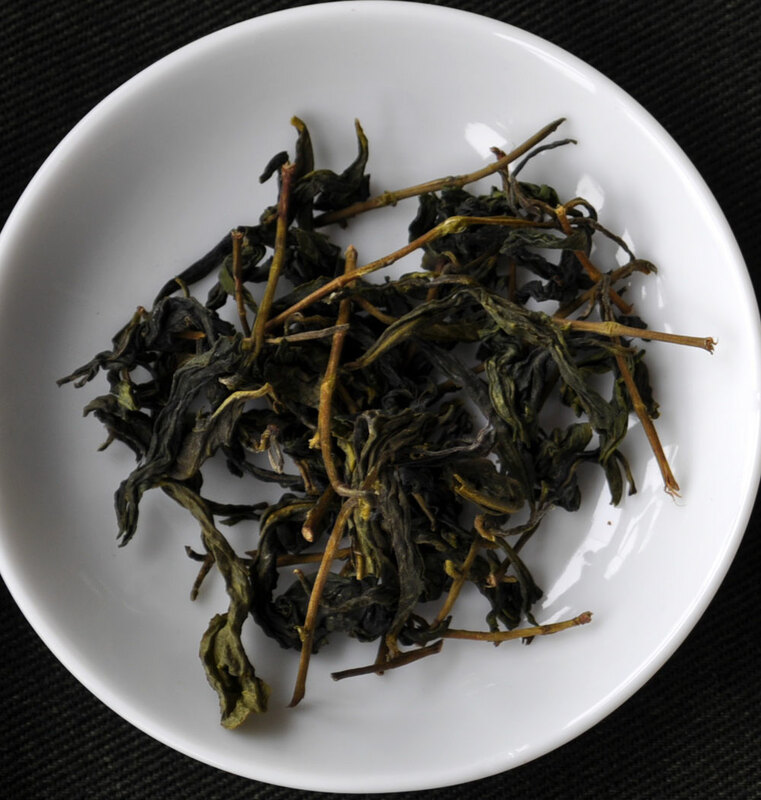 It's a 2008 'subtropical forest' Baozhong (one with a slightly stronger oxidation) that has been similarly roasted this January. I've compared it with the 2006 and it's indeed very close in its level of 'fire' and aromas. I just found it a little bitter and lacking refinement. 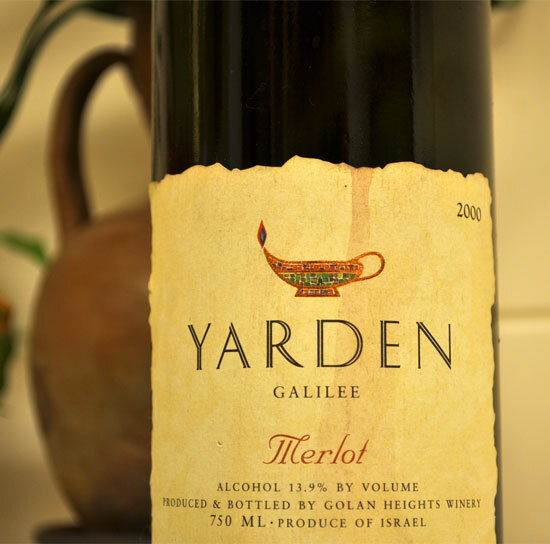 The 2006 had mellowed down in the meantime. On the other hand, this newly roasted has more energy thanks to its recent roast. These leaves have a very nice potential and are very close to what I am looking for. Maybe they just need to rest a year or two. Or, maybe I can find a way to make them smoother much faster?! Through a happy coincidence, I recently purchased this traditional, handmade and wood fired Yixing zisha jar. Hundreds of tiny imperfections visible up close show this piece has some age. Its clay is so smooth and firm! The round shape is a such a pleasure to hold and caress... But I disgress! From my previous storage experiment with jars, I remembered that Yixing clay can absorb some of the fire from roasted leaves. So, I wanted to see how this beautiful jar would impact this 2008 Qizhong Oolong. this antique hexagonal hungni jar. I liked its shape and pressed design. Also, its workmanship is incredible. 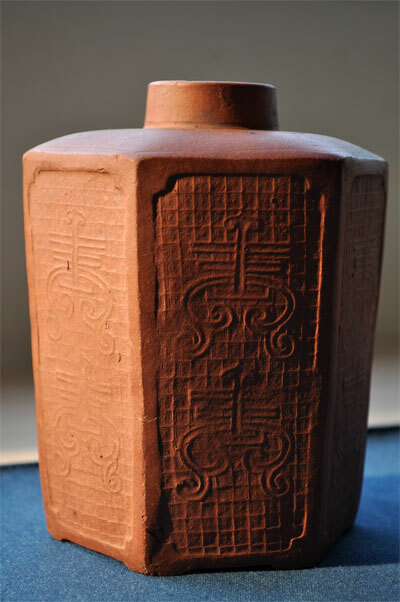 The walls are very thin and it weighs just 270 grams, much less than the zisha jar (470 grams). The result was stunning. 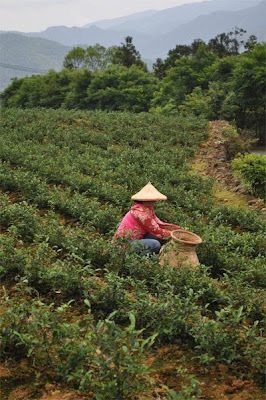 The Yixing jar had made a huge impact on the smoothness and refinement of the Qizhong Oolong. The fire has been tamed. There was still some bitterness in the brew. 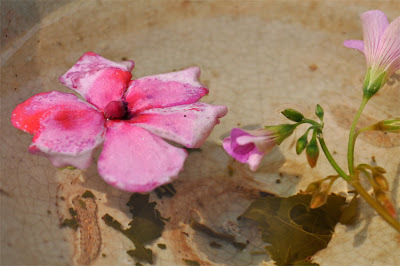 To get rid of it, I had to keep the leaves in the jar for 2 days. With the Hungni jar, I was less lucky. The brew lost some of its transparency and became a little cloudy. The tea's fragrance was spoiled. It wasn't a real surprise, though. When I bought this jar, it was almost black. I had to clean it with hot water, baking powder and a tooth brush. The inside still smelled humid and dusty (it must have spent the last 50-100 years in a basement storage). 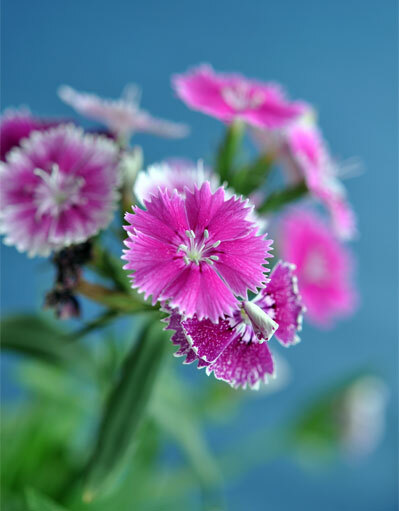 To cure this problem, I rinse it regularly with fresh water and place it on a terrace under direct sunshine. It seems to get better. Later, I also experimented with my best glazed jar. 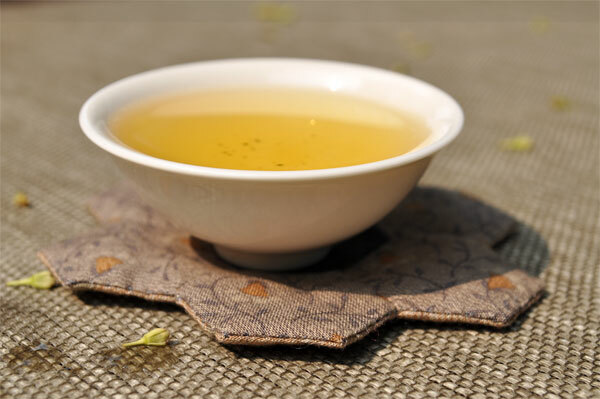 It also made the tea smoother, less firy. 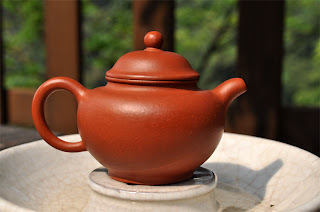 But while the Yixing would take a little substance away, the glazed jar would refine the aromas and keep its intensity! For a medium roast and several days of storage, it was better to use the glazed jar. 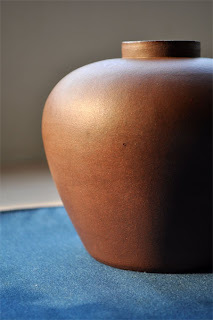 But for the immediate results, the Yixing jar gave me a faster improvement. Conclusion: I will add this tea to my selection and I suggest you also experiment with its storage. 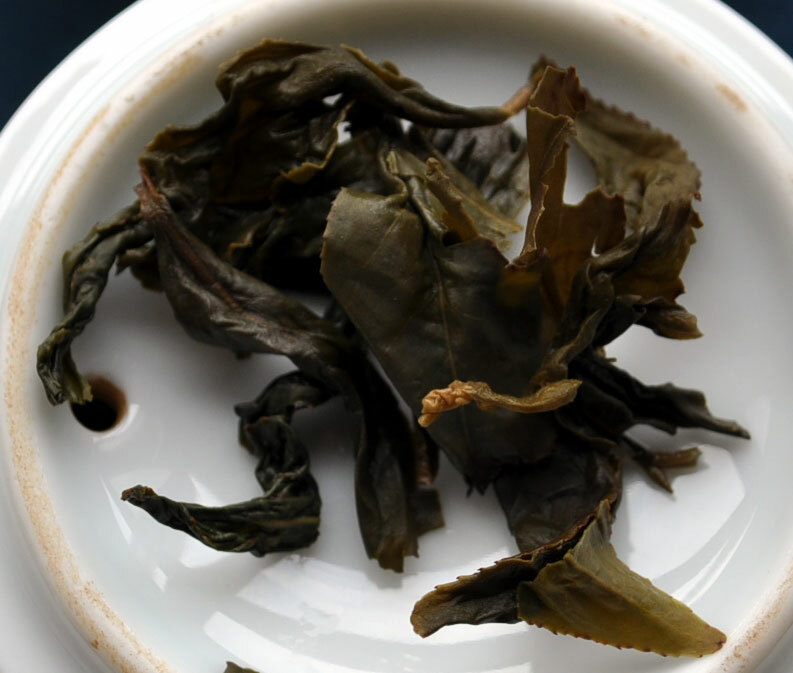 If you don't have a jar, I suggest you use a teapot or a gaiwan and see the difference for yourself! 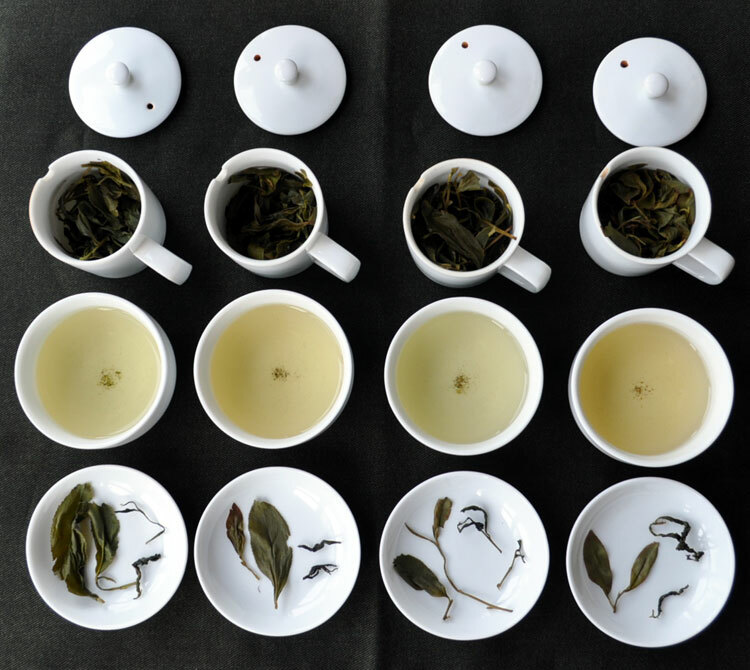 Experimenting with tea is a great, fun way to learn while enjoying its pleasures. 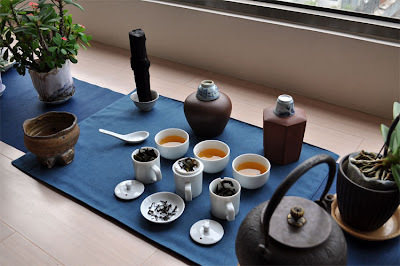 This week, during tea class, Teaparker made this even more obvious: he played an April Fool tea joke on us, his students. Teaparker opens a vacuum sealed plastic foil and gives me some leaves to brew in a porcelain competition set. 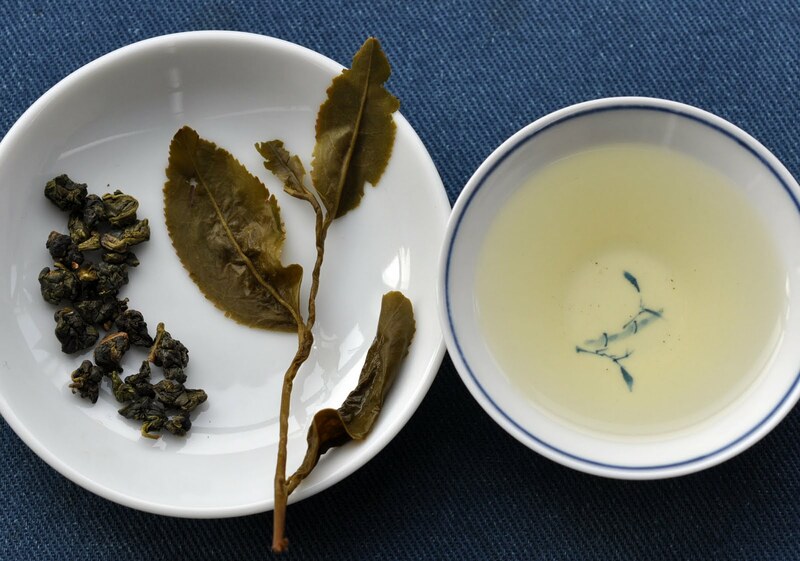 Since we are in 'testing mode', I use few leaves and a long infusion. Then, I fill everybody's cup with the tea. 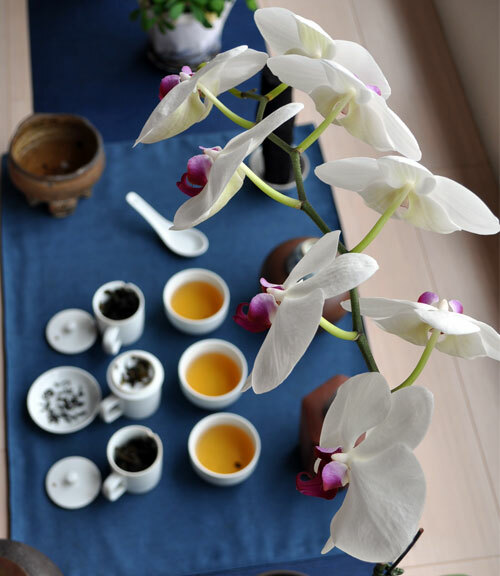 We smell the tea spoon, look at the brew and then drink the tea. 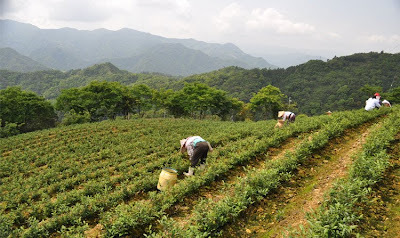 All Teaparker tells us is that this Oolong is from this spring's harvest. 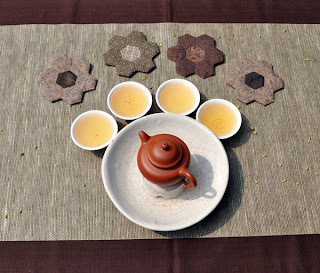 We find the tea very pure, but the fragrances are muted and there's something a tad uncomfortable and bitter that lingers on the mouth before vanishing into sweetness. My second brew is shorter and sweeter. We prefer it to the first brew. For the second sample, Teaparker took some Oolong leaves from a small celadon glazed jar. Again, it was up to me to brew the leaves in the competition set. I tried my best to use the same amount, pouring strength and time. This time, we were all thrilled. 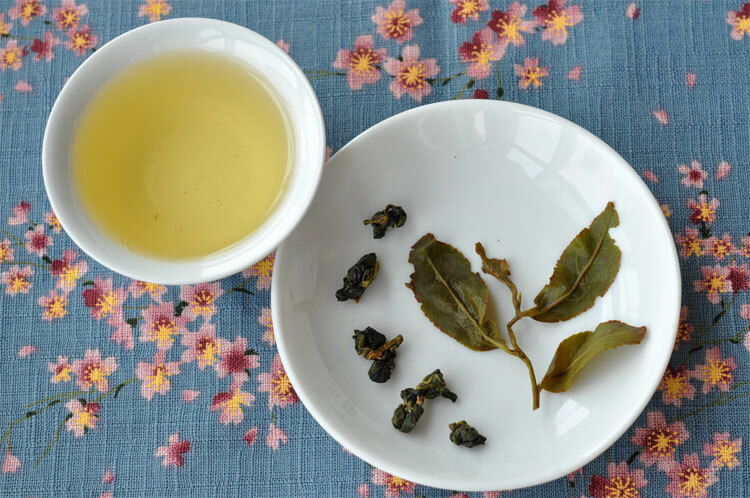 This Oolong tastes wonderful: it has the exuberance of spring and the stamina of the high mountain. The aftertaste seems never ending. The tip of the tongue keeps on releasing saliva and sweetness in the mouth. "It's like a flower that has opened up", I commented. "Exactly how I like my Oolong", said another student. 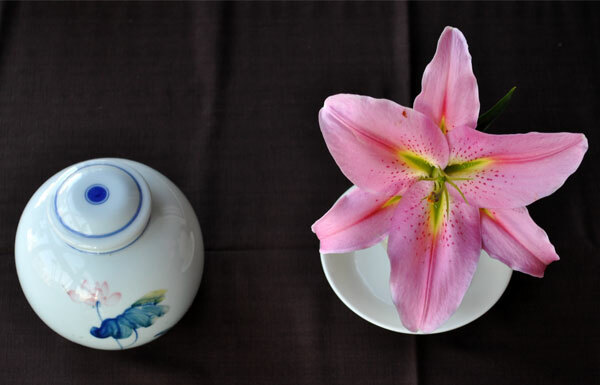 These two teas tasted so differently! The first was muted with a bitter touch, the second exhilarating and smooth. 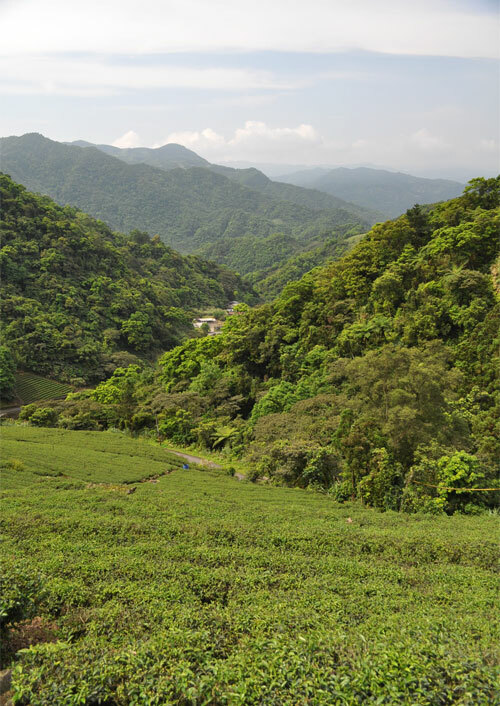 While we guessed correctly that both were High Mountain Oolongs from this spring, we were greatly astonished when Teaparker told us this: "These two samples are one and the same batch of High Mountain Oolong!" The first sample came from a just opened sealed foil. 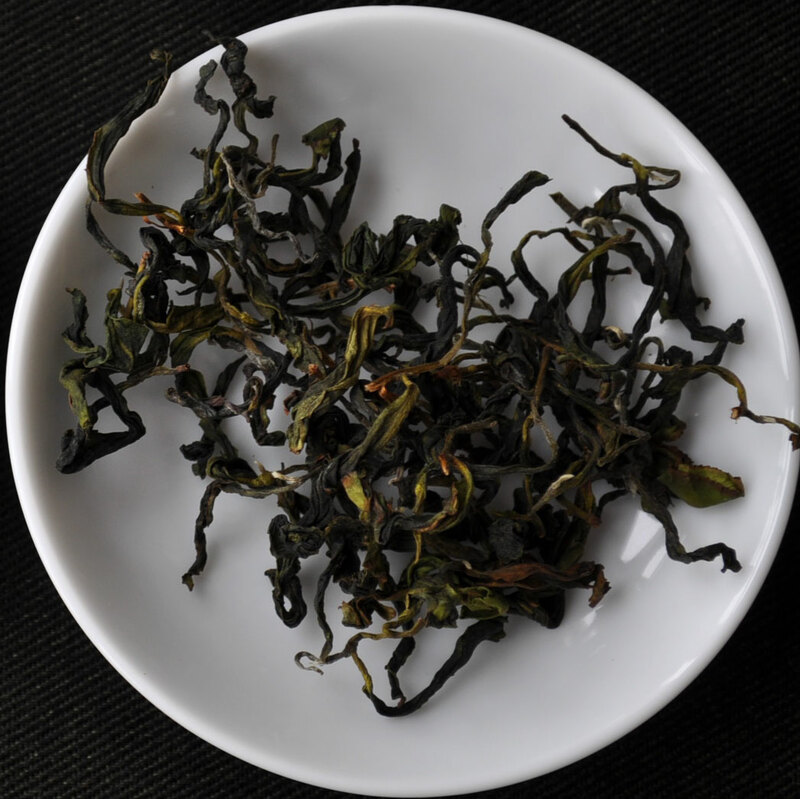 It hadn't have time to 'balance its moisture' (Hui Chao) as it was still very dry from being processed just 10 days ago. That's why it would still taste dry and a little bit uncomfortable. The second sample had spent several hours in a small closed jar and had had more contact with air. 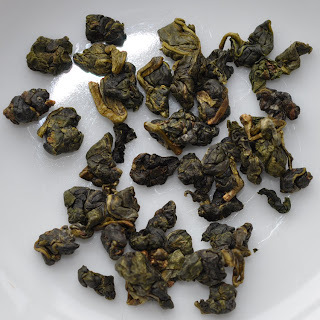 This showed us that a fresh Oolong could be too fresh and that we should be very careful in judging it. A good length and some bitterness that turns into sweetness is a good sign. What is important is a long aftertaste where the sweetness wins and replaces the bitter. 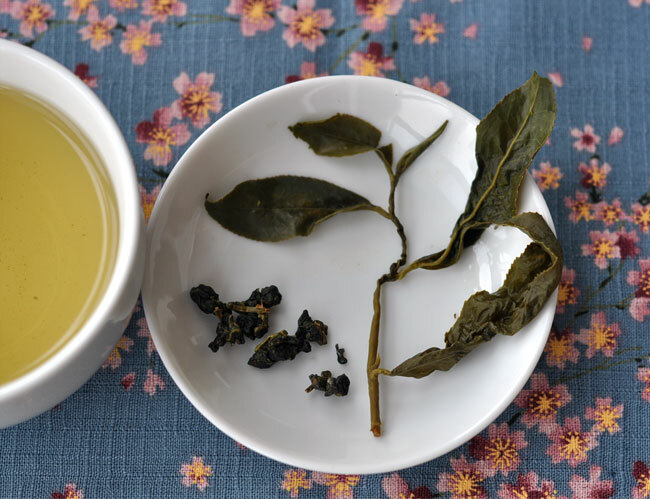 Let the fresh Oolongs 'open up' before brewing! Mon Jinxuan Oolong de ce printemps provient de la même plantation de Zhu Shan que celui de cet hiver. La différence entre ces deux thés est assez subtile et provient surtout du caractère de la saison (hiver/printemps). Comparer ces 2 thés peut donc être très instructif et un bon exercice pour affiner son palais. Récolté à la main le 28 mars 2010. (Récolte de 60 kg). Origine: Zhu Shan, comté de Nantou dans le centre de Taiwan. 1. Dégustation test de compétition: 3 grammes, eau bouillante, 6 minutes dans un set en porcelaine. L'aspect des feuilles est un vert relativement sombre, concentré. L'odeur sèche des feuilles est fleurie et herbacée. J'y trouve aussi l'odeur douce et chaude du soleil. 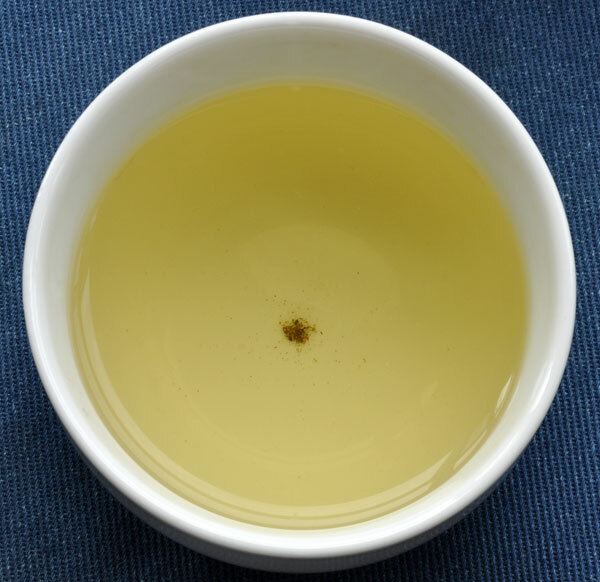 L'odeur de l'infusion est fraiche et légère, légèrement lactée. L'infusion est claire, transparente, d'un vert qui tire un peu sur le jaune. Au goût, il y a comme un moelleux profond qui s'imprègne dans la bouche et reste longtemps présent. On sent un peu d'amertume en retrait, mais elle laisse largement la place à la douceur et s'efface avec le temps. L'effet sur le corps est agréable. Le résultat est si bon que je fais une seconde infusion test de ces mêmes feuilles. En effet, avec des Oolongs de basse altitude et faiblement oxydés, on court souvent le risque de tout tirer de la première infusion et de ne plus rien avoir par la suite. Cela n'est pas le cas avec ce thé. Même après une seconde infusion test de 6 minutes, il n'avait pas encore tout donné. Les feuilles ouvertes laissent apparaitre de nombreuses feuilles. On y voit quelques morsures d'insectes, signe que le fermier, sans faire du 100% bio, limite autant que ce peut les pesticides. 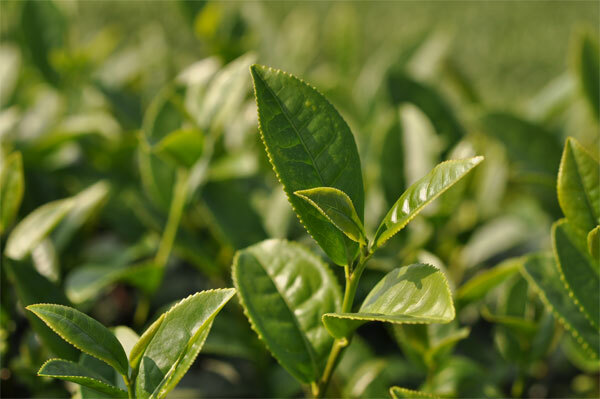 Les feuilles sont bien épaisses, ce qui explique pourquoi elles recèlent tant de saveurs pour tant d'infusions. 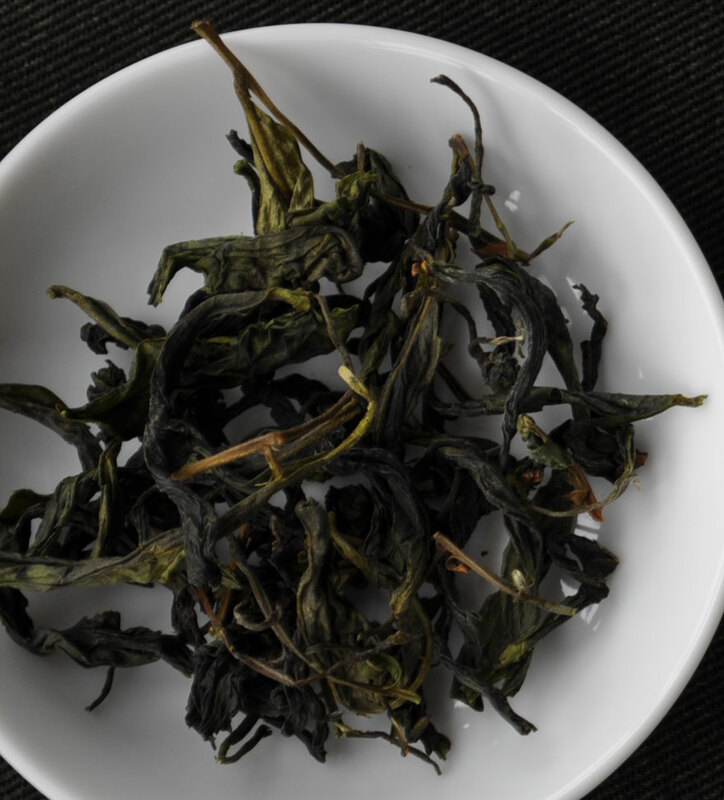 Ce Jinxuan Oolong va au bout de ses possibilités! C'est le meilleur rapport qualité/prix pour les amateurs d'Oolong frais de qualité. 2. Après ces dégustations tests en porcelaine, je passe à une dégustation en théière Duo Qio en zhuni et mes coupes en porcelaine fine Qinghua. Pour le reste, je garde mon Cha Xi tel quel. 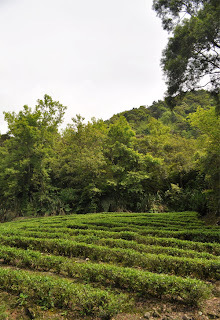 La couleur bleue représente pour moi le vaste ciel printanier au-dessus de Zhu Shan. Les nombreuses fleurs et plantes vertes montrent la beauté et l'éclosion du printemps. Je garde une eau bouillante pour l'infusion. La théière arrondit le goût et affine les fragrances. Le résultat en porcelaine était déjà très bon, maintenant il est superbe! Il m'étonne surtout par sa persistance, son yun. 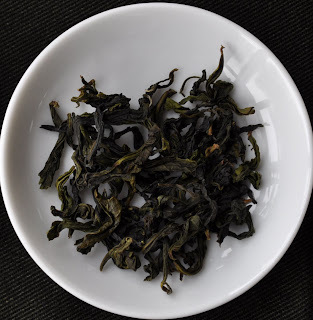 C'est si rare pour un Jinxuan ou un Oolong de basse altitude. 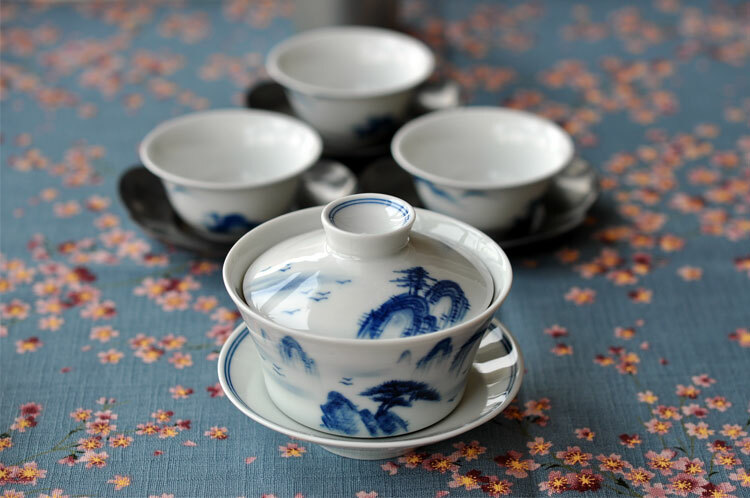 This tea set is wild at heart. It wants out and breath mountain air, under the sun. Last week, I could grant this wish. The cups, with their wide and high feet, occupy the space in an assertive way. 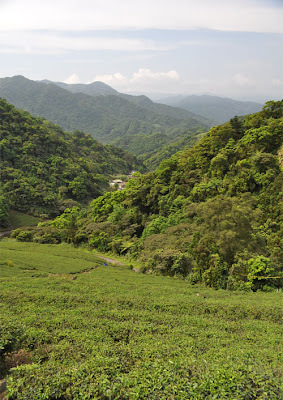 This elevation brings the tea closer to heaven. 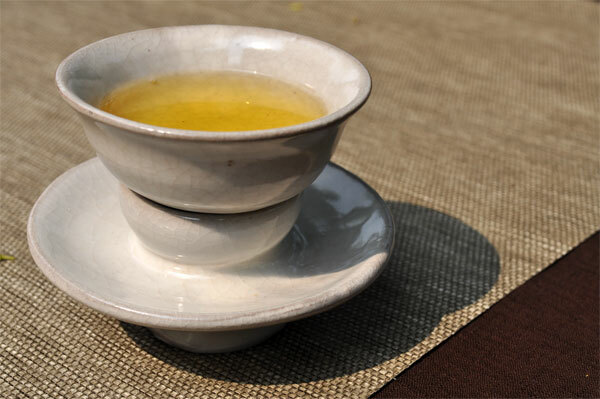 At the same time, this cup is heavy and requires some strength and focus to handle. Its stability and weight makes me feel secure, a similar feeling, I guess, like when driving a very big and strong car. I also feel a quaint, antiquated pleasure of handling a cup with such an old fashioned shape. 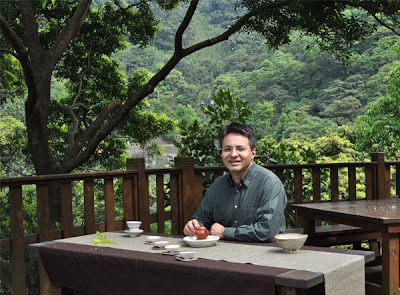 The size of the cup is also a contrast with the smaller gongfu cha cups I usually use. Je choisis des couleurs naturelles pour mieux fondre dans mon cadre verdoyant. Mon thé est l'excellent Hung Shui Oolong de Feng Huang (Dong Ding) d'automne. Les coupes évasées ivoires rehaussent la couleur d'or de l'Oolong et permettent de bien apprécier sa clarté. La contenance des coupes est faible. On déguste chaque goutte. Plaisir intense. L'assiette Ge et son support à théière de David Louveau se marie facilement avec le décor extérieur. La théière en zhuni Duo Qio est d'une élégance plus citadine. 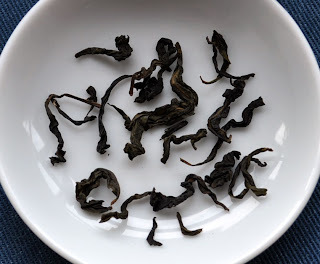 Sa forme ronde convient bien au Oolong roulé. Dure, elle a un bon rendu des fragrances tout en donnant de la profondeur et de la rondeur au thé. Un Taiwanais intrigué vient me voir. Il fait son thé à une table voisine avec le service en plastique fourni par le restaurant. Il me complimente sur le joli design. Au départ, il pensait que c'était juste pour prendre de belles photos. Mais quand il a vu que c'est ainsi que je prépare et bois mon thé, il a été vraiment surpris. Le même thé qu'en novembre m'a paru particulièrement réussi ce jour-là. C'est la récompense des efforts et des attentions aux détails. 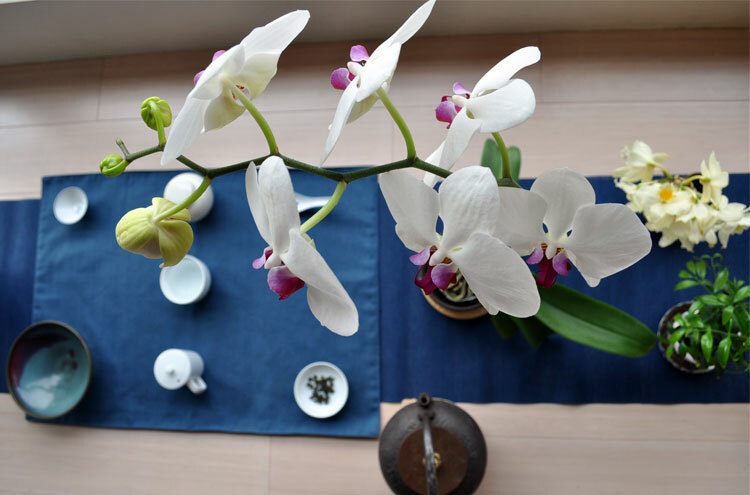 Quand les accessoires et le thé vont de pair, et qu'on est de surcroit dans un cadre extérieur magnifique, on a tout pour réussir. Or I could have brewed (to death) a great 30+ years old tea on Friday and 'resurect' it on Sunday with a few more brews. 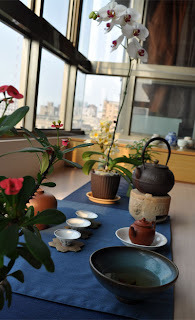 Such teas taste really 'divine'! Instead, I was lucky on Good Friday: after a (Japanese) lunch in a new neighborhood, I entered a wine shop and discovered this very last bottle from Yarden!